Making memory wire beaded jewelry bracelets using memory wire coils and colored glass beads. 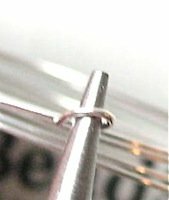 This wire is quick and easy to work with, it is great for creating glass beaded jewelry. It usually comes as a coil of wire from which you cut the length you need. The wire comes in different sizes for rings, bracelets and necklaces. This style of beaded glass bracelet can be made with a variety of beads and colors. You can easily mix size and colors on this type of beaded jewelry bracelet. The number of coils and bead size determines the width of the bracelet. For this bracelet cut four coils of wire with heavy duty side cutters. Do not use your normal side cutters, as the wire is very hard and will ruin your cutters. Place end of wire in round nose pliers, roll your wrists and form a small loop. Spread the coils so that the wire is easy to work with. Thread your beads on to the wire. Step 3:Once you have all the glass beads on the wire make sure there are no gaps and then repeat the same type of loop as Step 1. If you wish you can make a small bead dangle to fit the coil on either end. Instead of forming a loop on each end you can buy end caps that are glued to the wire ends to hold the beads in place. You will notice from the finished piece that there are various shapes and colors, these types of bracelets allow you to have fun with colors and shapes. This style of beaded glass jewelry bracelet can be made with so many bead types and colors that the design options are almost endless. 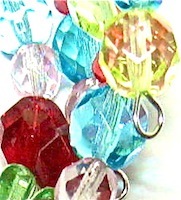 You can add small bead dangles or charms between the beads which will give great color and movement to the bracelet.